Coachman made big changes for the 2016 season, in a drive to cut weights across the board. As a result, tweaks to the VIP range for 2017 have been fairly minimal. There are no new layouts, and in the majority of models it’s simply a case of freshened-up interiors and some smart new graphics. Certainly the traditional looks remain – although that’s no bad thing. It may be getting long in the tooth, but the VIP still looks elegant and upmarket, set off by its graphite roof rails and sills. It’s not all business as usual, though: the four-berth VIP 565 has had an internal rethink in response to customer feedback, in particular in the rear bedroom. The fixed twin beds make this an ideal layout for couples who want a fixed bed but would prefer not to disturb their partner when they use the end washroom, or families who are happy to make up the front double each night. And to see other Coachman caravans for sale, click here. The VIP is Coachman’s flagship single-axle, so spec is as generous as you’d expect. There’s a full complement of Al-Ko extras for the galvanised chassis – from ATC stability control to shock absorbers and a Secure wheel lock – as well as alloy wheels, external gas barbecue and 230V points, plus a hatch to access the under-bed storage area. Otherwise the nearside wall is uncluttered, with access to all services – and even the fridge vents – on the offside, well away from your awning. All winders for the heavy-duty steadies are easily reached, too, and the controls – including for the Alde heating and main lights – are just inside the one-piece glazed door, which is held open by a magnetic retainer. You will need to check that you have a hefty enough tow car, though: the 1630kg MTPLM demands a 1918kg tug to make an 85% match. The main living area of this Coachman caravan is unusually bright, with plenty of glazing augmented by a rooflight and a massive sunroof, all lightened yet further by pale fabrics. There are end bolsters and four large, attractive scatter cushions, with matching good-quality curtains. Up front there’s a chest with two usefully large, deep drawers, and if you struggle for places to put souvenirs picked up on your caravan holidays, you’ll love the thick shelf above the window. Beneath it there are two speakers, sensibly sited to project sound into the room, and above the cupboards there’s attractive ‘halo’ lighting. The high-backed, comfortably raked sofas are a good length and encourage you to recline to enjoy the TV – points for which are positioned over a small sideboard beside the entrance door. And it’s good to see that this is also where you’ll find a freestanding lounge table. There’s plenty of worktop in the kitchen of this 2017 Coachman VIP 565, even without a pop-up flap. And, should you need more, glass covers for both the sink and the dual-fuel hob provide additional food-preparation space. Beneath, you’ll find a separate oven and grill, a fridge/freezer and useful storage in a cutlery drawer, three further drawers and a pan cupboard. White overhead lockers give the kitchen a sense of separation, but are tied into the main décor theme by attractive graphite bands. The standard microwave alongside – and directly over the hob – is now in a snazzy surround, rather than in its own separate cupboard as before, and there’s an Omnivent overhead. Spacious and with a classy finish, the full-width end washroom has all you would expect, from the heated towel rail to a pair of bathroom cabinets, some useful shelves and a backlit mirror. Two rooflights and a smoked window look after daylight and ventilation, and there’s a huge, fully lined shower cubicle featuring moulded shelves and an EcoCamel Jetstream showerhead. It’s in the rear bedroom where the most obvious changes to the Coachman VIP 565 are found – specifically, the beds themselves. 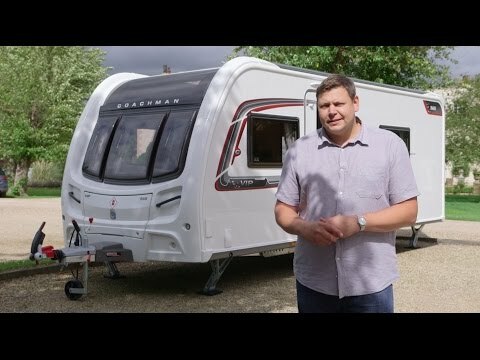 Coachman Caravans' customers asked for them to be lower and wider – and now they are. The nearside bunk is 6ft 2in long and both are 2ft 5in wide, but that on the offside is shorter, at just 6ft. Each gets an attractive padded headboard, speaker, window and reading light, but the nearest shelf is high enough that you’ll have to get out of bed to reach it. Nevertheless, there’s a TV point and mirror on the nearside, plus a fabric screen to close off this area. But the biggest difference is the amount of natural light in here, thanks to the addition of a ‘Sky-view’ rooflight (as used by Lunar and Elddis in their upmarket lounges) that’s ideal for stargazing. Up front, the 5ft sofas are too short to be adult single beds, but you can pull out the base beneath the offside sofa and rearrange the cushions to create a narrow double bed. Part of the reason why the VIP 565's washroom feels so spacious is that it doesn’t have to fit in a wardrobe – that’s because the under-counter fridge frees up space on the nearside for a big wardrobe and a pair of drawers beside the entrance door. There are drop-down flaps to access the space beneath all bunks, plus a small drawer under the offside fixed bed, along with overhead lockers. All the bed bases rise on gas struts, too. As well as the external hatch, there’s a good-sized front gas locker. To make use of all this space, you may want the free weight-plate upgrade to 1700kg, extending the payload to 224kg. The Coachman VIP might now be starting to look its age, but it remains an enormously desirable caravan – and the revisions to the 565 for 2017 serve only to enhance the layout’s appeal. It’s also one of the brightest tourers we’ve been in for some time. That is thanks to five rooflights, 10 windows and that huge sunroof, which results in a very pleasant ambience. It’s not cheap – or lightweight – but if you can afford it, and have the car to tow it, this is a very special couples’ caravan.